From the moment Chucklefish’s Wargroove was announced in February 2017, fans hoped that Intelligent Systems’ long-abandoned Advance Wars had finally found a true spiritual successor. 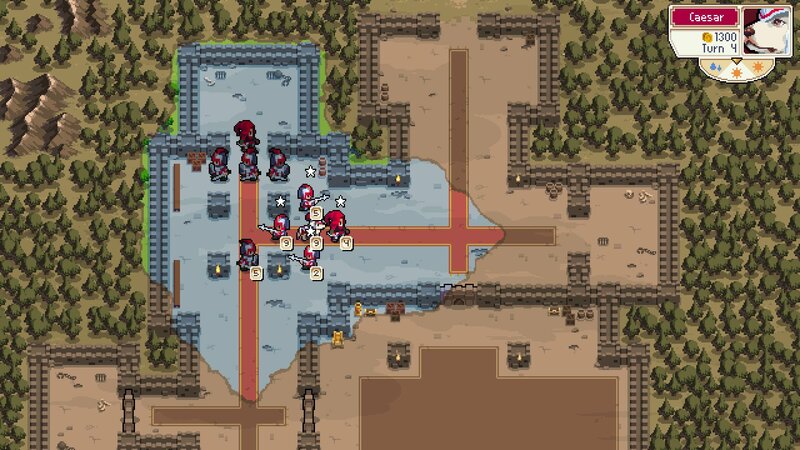 Now that it’s out, we can safely confirm that Wargroove is the serious strategy game with a lighthearted story you’ve been waiting for, for the decade since Advance Wars: Days of Ruin was released on the Nintendo DS. Wargroove is a turn-based strategy game that gives players control of four different nations vying for control of a fantasy world. It takes many of its mechanical cues from Intelligent System’s Advance Wars while creating a fantasy setting similar to that of Intelligent System’s Fire Emblem. Unlike Fire Emblem (and similar to Advance Wars), players will need to manage their economy in each mission. Villages under your control earn you valuable gold each turn, which can be used to recruit new units, like swordsmen, knights, witches, dragons, and warships. There are twelve different campaigns -- one for each commander, and three commanders for each nation. Unlike many tactical strategy games, commanders play a role in battle, overpowering basic foes and augmenting forces with a titular wargroove. These charged abilities can be used to heal allied units, instantly spawn allies, or block an enemy’s path. A variety of objectives keep things fresh, whether you’re tasked with taking down an enemy commander or their fortress or shuttling villagers in wagons to safety as the enemy horde closes in. There’s symmetry across factions, making the four nations essentially a palette swap. This does mean, for instance, that each nation’s swordsman unit might look different, but function identically. However, this is largely mitigated by a deep bench of units to choose from, each of which has their own ways of setting up critical hits. It also means that your kids will have a slightly easier time picking this up and playing alongside you or against you. They can pick their favorite faction by appearance, whether it’s the undead Felheim Legion or the plant-based Floran Tribes -- the only real difference is the commander ability. I played Advance Wars, but what does Wargroove do differently? Wargroove is packed with more than just campaign and online competitive play. An arcade mode pits you against five commanders in succession. There’s also a puzzle mode that is akin to what’s available in the mobile game Fire Emblem Heroes. When each puzzle starts, you’ll be tasked with winning with the limited units on hand or in a limited number of moves. The star of the show is the creation suite. Not only can you build new maps to your heart’s content, but you can string them together into unique campaigns, complete with cutscenes. The cutscene editor is intuitive, allowing you to add different characters, emotes, dialog, sound effects, and music all against a variety of backdrops with ambient noise. Once you’re finished, you can upload your creations for others to play. This also means that you don’t need to be a creative type to get some mileage out of the tools. You can download maps and campaigns built by other players to extend your time with the game. The built in filters are useful for beelining straight to the kind of content you’re looking for. If you’re the devious type, you can also try your hand at building out Wargroove puzzles. There are clearly marked settings in the map creator, so you can try your hand at being clever. How can I play with my kids? 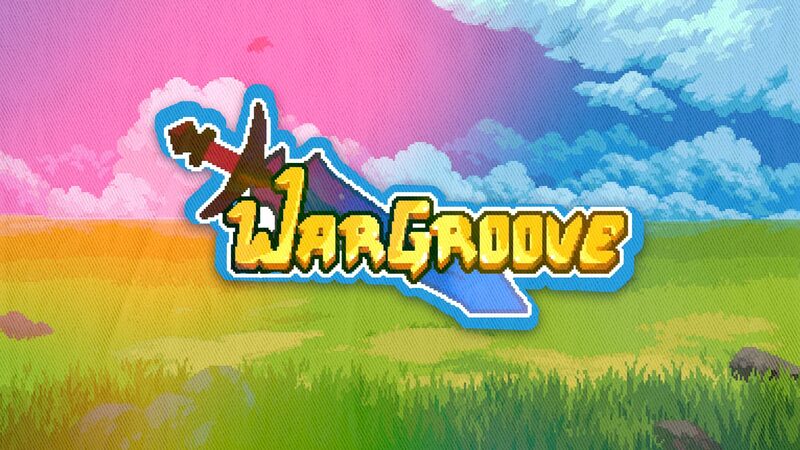 Wargroove features both local and online play in both competitive and cooperative modes. There are forty 1-vs-1 maps, but the game scales to three-player and four-player modes in either team-play or free-for-all. There are limited two-versus-one maps, so your kids can team up to take you down. Thanks to community creations, there are more of these to find online. Additionally, you can set some of the players in multiplayer skirmishes to AI control. That way, you and your family can team up or beef up the player count without having more people on the couch. Since Wargroove does feature local play, you don’t need to have more than one console or PC on hand. The hot seat mode is set up to work with the fog of war (should you choose to enable it). Before each turn, the active player must press and hold a button to take control. This minimizes the previous player accidentally starting the next turn and getting an illegal peek at an opponent’s position on the map. If you do have multiple systems or don’t have an opponent on hand, playing online is easy, too. 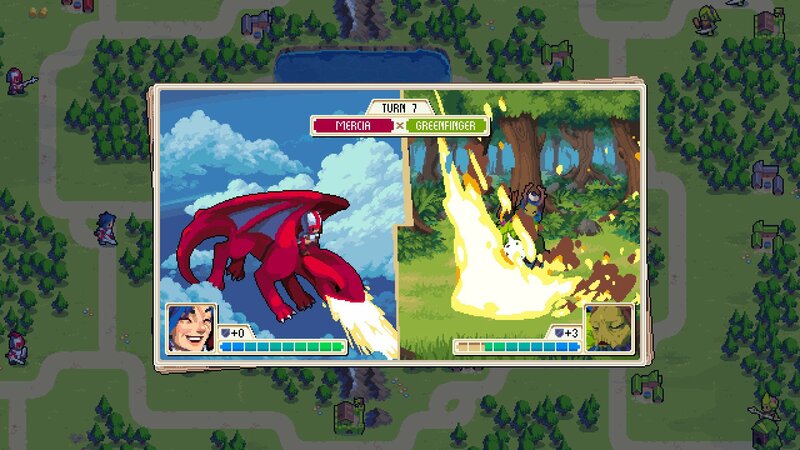 Wargroove features crossplay on PC, Xbox One, and Switch. Wargroove has a full feature set for competitive and cooperative skirmishes. If you don’t have time to set up a tactical board game, but want to get the same kind of experience, this is a solid alternative. Wargroove takes its inspiration from some of Intelligent Systems’ most beloved games. It doesn’t stop there, though. 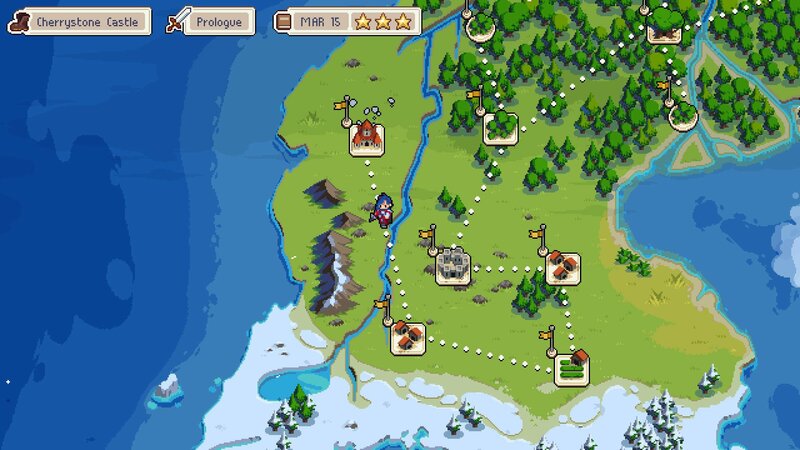 The world, characters, and writing set Wargroove apart from the shoulders on which it stands. This is no copycat, but an evolution of a genre that has endeared itself to so many. The blend of lighthearted writing, dire consequences, attractive character design, and serious strategy works perfectly in Wargroove. That said, it’s easy for younger players to get frustrated. Before diving into competitive play with your kids or handing them the campaign, sit with them and work through some of the excellent tutorial missions. Show them how to access the codex, which has full listings of unit types and how to activate their unique critical hit conditions. Once they understand the basics, hand over the controls and stay on hand to offer pointers when asked. After they’re comfortable, then it’s time to throw down the gauntlet. If you want them coming back for more, make sure your kids are equipped for success, even if they might not beat you. Wargroove is an excellent first strategy game for kids, inspiring critical thinking and consideration of consequences. Every wrong move is a lesson, and every victory is earned.